Krakow - Tethered to seats in the stands so far at the European Championship, Wayne Rooney is finally ready to burst into life at the European Championship. With his two-match suspension completed, the spectator will become the striker again on Tuesday against Ukraine, hoping to steer England into the quarterfinals. The Manchester United player will be unleashed in Group D after missing the draw against France and victory over Sweden. 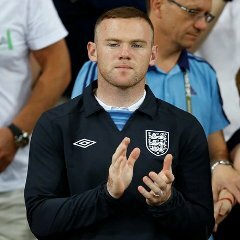 And to accommodate Rooney, coach Roy Hodgson will make a change to the side that beat Sweden 3-2 on Friday, dropping either goal scorer Danny Welbeck or Andy Carroll. Hodgson says "Rooney is a special player and it would be very difficult for me to quite frankly to leave him out of the team."